For any issue or question related to TEMASOFT FileMonitor, please use the following resources. If you still don’t find an answer, please use the request form below to contact us. We will contact you back by email or by phone as soon as possible. In order to find out more information about how certain aspects of the product work, it is a good start to check the answers to the most common questions. Click here to open the FAQ section for TEMASOFT FileMonitor. Before investigating any issue you should check your systems against the product requirements to make sure they match. Click here to view the requirements for TEMASOFT FileMonitor. The reference source of information of the product is always the User Manual. Click here to access the TEMASOFT FileMonitor User Manual. If you didn’t find the answer to your problem already, click here to create a support ticket. Expand the following items to view the answers to some of the most common questions about TEMASOFT FileMonitor. What is TEMASOFT FileMonitor ? TEMASOFT FileMonitor is a file access auditing solution delivered as on premises software, with an agent-based architecture, featuring a web-based management console. How does TEMASOFT FileMonitor work ? TEMASOFT FileMonitor uses agents that must be deployed on the computers to be monitored. The agents will audit file activity and send the data to the TEMASOFT FileMonitor server. The TEMASOFT FileMonitor server saves the information in an SQL Server database and features a web-based management console that provides access to the management, data analysis, reporting and alerting features. How is TEMASOFT FileMonitor licensed ? There are two types of licenses and two types of nodes in TEMASOFT FileMonitor. Commercial license key: this key requires activation as per the steps in the paragraph below. The product will function for a period of time and thus allow the activation process to take place after the key has been entered and the product has been used. However, if the key is not activated in time, the product will cease to function. Customers who do not activate their license keys cannot receive support. Freeware license key: this key does not require activation and can be used to monitor two workstations indefinitely. Generic nodes (or machines): These nodes can be assigned to any supported operating system and are more expensive than Windows workstation nodes; typically, these nodes are used for Windows servers and supported Linux machines. This view will contain the license key details such as licensed product version, company name, license expiration date, license status (expired or not) and the number of generic and Windows workstation nodes. In order to change the licensing, you need to click on the “load license file” button. In order to complete the process, you will be required a license file that is provided to you by TEMASOFT. Which actions are audited by TEMASOFT FileMonitor ? Process related: Process creation, Process termination. File related: File created or opened (when logged on a Windows machine, this indicates that a file has been created; when logged on a Linux machine, this may indicate either file creation or file opened operation), File read, File write, File delete, File rename, File copy, File attributes change, File security change, File archived, File attached to Outlook, File moved to recycle bin, File restored from recycle bin, File open or create failed, File content duplicated, File probably archived (when several levels of nesting are used, it is not always possible to detect exactly which file was archived). What information does TEMASOFT FileMonitor deliver for each audited operation ? Essentially, TEMASOFT FileMonitor delivers information about the type of action, the user who has performed the operation, the process executable (and its path) that was used during the process, the timestamp, the file name, the destination file name (for copy, rename, etc.) and more. For a complete list, please see the product manual. Can TEMASOFT FileMonitor audit copy operations to network or removable devices ? Yes, TEMASOFT FileMonitor can audit file copy operations from a monitored machine to the network, as well as file copy operations to removable storage devices. In the first case, the destination file name will contain the network path. In the second case, the operation will be flagged as “File is located on removable device”. What special flags can TEMASOFT FileMonitor assign to file operations ? User was impersonated: if set, it means that the process that generated the event impersonated the user listed under the field user name. For further forensics, please see all the available user names: process, handle, thread, etc. File is located on removable device: if set, it means that at the time when the action occurred, the file resides on a removable device. This is useful to identify file copy operations when the destination is a removable device. The file was changed by this operation: if set, it means that the operation resulted in a change to the file – used for easy monitoring of file changes without complex filters on the action type. – Installation detects any missing software prerequisites and then lists all software prerequisites and their status. Click “Install” to install any missing software prerequisites; for this step it is recommended to have an active internet connection, as some of the missing prerequisites might need to be downloaded from the internet. NOTE: If you de-select any of the software prerequisites, you will need to install it manually, otherwise the product installation may not succeed. – Next, the installation will perform the necessary operations and display the “Installation Completed” dialog. Click “Finish” to complete the installation. The “Default Configuration Wizard” will start. The settings required for the Default Configuration Wizard differ depending on the deployment scenario. Please continue reading the deployment scenario that fits your IT environment. – “Service Account” section: please enter the credentials of a Domain Administrator, in the format DOMAINUsername. The credentials are validated when clicking “Next”. You cannot skip this step. If the credentials are invalid, the installation will not proceed. The Default Configuration Wizard will register the TEMASOFT FileMonitor Server Service to run under these credentials. The service requires domain administrative credentials in order to connect to remote computers in the domain, for installing, updating, removing and maintaining FileMonitor Agents. – “Configure SQL Server” section: Please select one of the existing Microsoft SQL Server™ instances. Note that the installation kit can deploy locally the Express edition of Microsoft SQL Server 2014, in case no other Microsoft SQL Server™ instance is selected. Next select the type of authentication to be used. In case SQL Authentication is used, you will need to provide the SQL credentials of a user account with CREATE ANY DATABASE right. This user should also have the DB_OWNER role on every database that will be created by the product. The installer will verify if these privileges are set and will attempt to set them automatically if not already set. If Windows Authentication is used to access the database, it is recommended to use a user who is member of the Administrators group, as, by default, this group has all the necessary rights to perform the necessary database operations. The Default Configuration Wizard will verify the SQL settings before proceeding and prompt to correct any errors. – “Installing IIS and features” section and subsequent steps: There is no user input required for this section and the subsequent steps. The wizard will enable IIS locally, configure it accordingly and then will deploy the necessary files for TEMASOFT FileMonitor Server. The website will run on TCP port 1753 by default. The next step, after having installed the TEMASOFT FileMonitor Server, is to deploy agents on the domain computers that need to be monitored. The user interface delivers functionality to add agents either manually, or automatically, from the central console. The automatic deployment works either by adding the computer IPs or names to the user interface and clicking the “Install agent” link, or by importing the names / IPs of the computers to be monitored, from a text file (formatted as one computer name or IP per line). When installed in a domain environment, TEMASOFT FileMonitor Server will present an additional option, when clicking the “Plus” button in the “Monitored computers” section of the “Settings” page. This option will display the list of computers present in Active Directory, and enable you to select the ones that you want to monitor. Please note that in order to be able to retrieve the list of computers in Active Directory, the service must run under domain administrative credentials and the TEMASOFT FileMonitor Server needs to be installed on a computer in the domain. The monitoring profiles are very important for performing file activity auditing operations, as they instruct the TEMASOFT FileMonitor Agent, which folders and files to monitor. There can be only one monitoring profile assigned to a computer or to a group of computers. 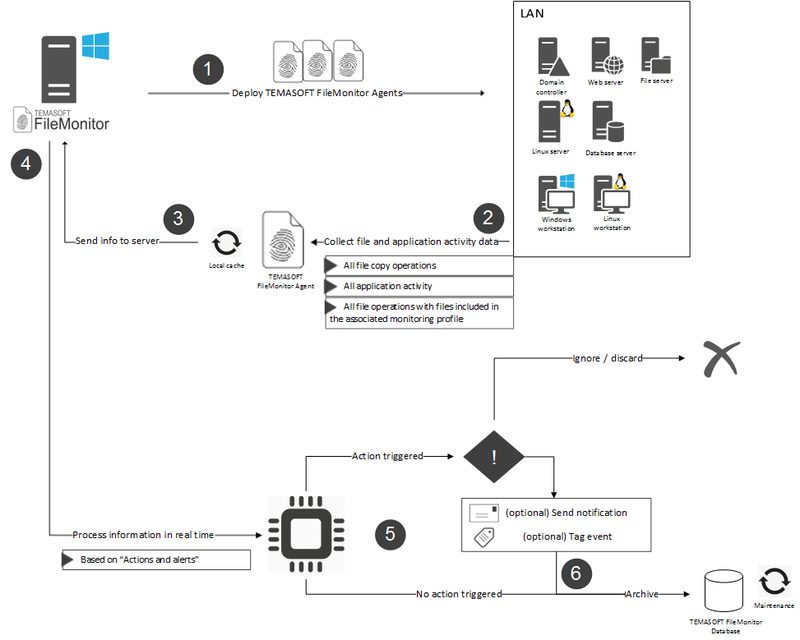 Hence, the monitoring profile must be built in such a way as to cover all the paths that are required to be monitored. TEMASOFT FileMonitor Server comes with a list of predefined monitoring profiles that cover basic use cases. You can use one of these profiles or create your own monitoring profiles. For more information, please see the product manual. Expand the following items to view the system requirements for each of the TEMASOFT FileMonitor components. Please note that we do not support the “Home edition” for any of the above desktop operating systems. Also, we do not support the Core editions of the server operating systems. Please note that we do not support the “Home edition” for any of the above desktop operating systems. Complete the form below to report an issue. We will investigate the problem and send you an answer by email as soon as possible.